This is a review of MD Nutri Hair. The manufacturer claims this product is specially formulated to correct over shedding of the hair as well as breakage in the hair. The product can be used by both men and women to make their hair healthier. To learn more about Nutri Hair’s ingredients, guarantees, price, side effects, and if this may be the right product for the health of your hair continue reading. The active ingredients in this product are collagen, flaxseed powder, ligan powder, lilac extract, niacin, D Alpha Tocopheryl Acetate, and biotin. Collagen maintains the flexibility and strength of the hair. Flaxseed powder is an anti-inflammatory. Ligan powder, D Alpha Tocopheryl Acetate, and vitamin E is an antioxidant. Biotin helps support cell health. Lilac extract helps with the breakage of hair and sensitivity in the scalp. Niacin improves hair’s shine and luster by thickening and strengthening hair. One capsule a day is the recommended dosage. As with most supplements it is also recommended to be taken with food. Constipation, upset stomach, and diarrhea are some of the possible side effects of this product. Most times these effects end once the body gets used to the supplement. Allergic reactions include dizziness, rash, and trouble breathing. If any of these occur discontinue use and see your physician. The price for Nutri Hair is $50.00, shipping and handling are extra, this is a thirty day supply as each bottle contains thirty capsules. There are no discounts available. This product can be found at a couple of discount drug stores, and they may have sales on the product from time to time, check the website for more information about where Nutri Hair can be purchased. Nutri Hair does not have a guarantee. No refunds will be given if not satisfied with the results after using this product. If the product arrives and the packaging looks to be tampered with or there is a defect with the bottle, they will allow you to send that package back as long as it is within thirty days of purchase, and they will send you a new one. Besides defective items, there are no monetary refunds. 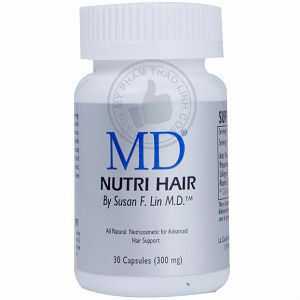 MD Nutri Hair had many positive reviews by consumers on its website. Research showed feedback on other sites had a fifty/fifty ratio concerning the products results. While most consumers claimed to see results, some in as little as two weeks, not all reported it worked quickly. One consumer wrote it took a year to see any results. The negative feedback was mostly centered around the consumer seeing no results and feeling disappointment at the amount of money they were out for no reason. This product has a price tag in the mid range of hair regrowth products and the manufacturer offers no guarantees. John Brownstone	reviewed MD Nutri Hair	on August 3rd	 and gave it a rating of 3.